Scary Spice Melanie Brown is officially selling off some of her personal belongings and giving the proceeds to charity, in an online auction that officially began earlier today. Up for grabs are 89 items from the performer’s personal home, including decorator items, clothing – even a set of hair crimpers, and it’s all currently starting at just 99p (about $2.50 Aussie dollars). You can even snap up the amazing car coat Mel wore in the Spice Girls ‘Stop’ video! 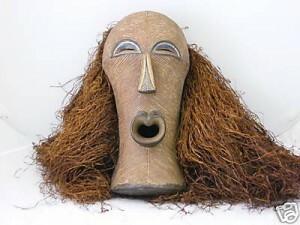 We must admit though, this African mask (below) scares the absolute life out of us – no wonder she’s selling it!! All proceeds from the sale go to ‘Clic Sargent’, a British charity set up to care for children living with cancer. So you want a piece of Mel? CLICK HERE.